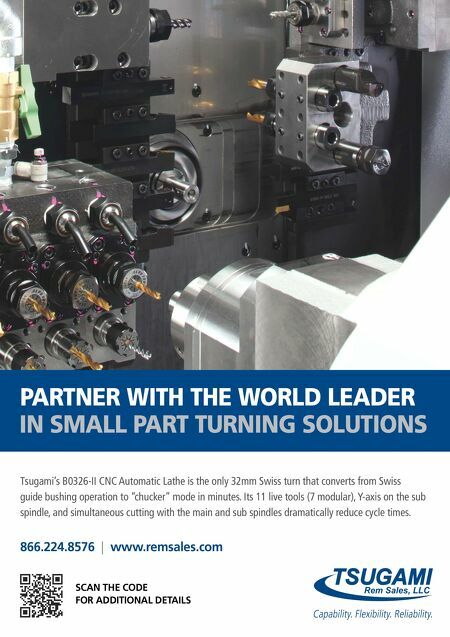 106 MMS December 2017 mmsonline.com BETTER PRODUCTION Shops Using Technology HUDSON BOAT WORKS PROBLEM Outsourcing molds to make a new boat would be expensive and slow SOLUTION Datron MLCube VMC RESULTS Able to machine large molds in house and get its new product to market three years ahead of schedule S aving time can mean saving money, especially in machining. 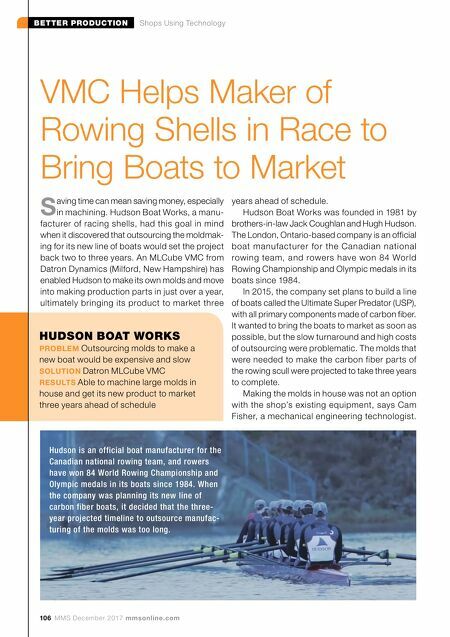 Hudson Boat Works, a manu- facturer of racing shells, had this goal in mind when it discovered that outsourcing the moldmak- ing for its new line of boats would set the project back two to three years. An MLCube VMC from Datron Dynamics (Milford, New Hampshire) has enabled Hudson to make its own molds and move into making production parts in just over a year, ultimately bringing its product to market three VMC Helps Maker of Rowing Shells in Race to Bring Boats to Market years ahead of schedule. Hudson Boat Works was founded in 1981 by brothers-in-law Jack Coughlan and Hugh Hudson. The London, Ontario-based company is an official boat manufacturer for the Canadian national rowing team, and rowers have won 84 World Rowing Championship and Olympic medals in its boats since 1984. In 2015, the company set plans to build a line of boats called the Ultimate Super Predator (USP), with all primary components made of carbon fiber. It wanted to bring the boats to market as soon as possible, but the slow turnaround and high costs of outsourcing were problematic. The molds that were needed to make the carbon fiber parts of the rowing scull were projected to take three years to complete. Making the molds in house was not an option with the shop's existing equipment, says Cam Fisher, a mechanical engineering technologist. Hudson is an official boat manufacturer for the Canadian national rowing team, and rowers have won 84 World Rowing Championship and Olympic medals in its boats since 1984. When the company was planning its new line of carbon fiber boats, it decided that the three- year projected timeline to outsource manufac- turing of the molds was too long.